Give a New Mom a Mom & Baby Gift Box Subscription. Free Shipping! I am now 32 weeks pregnant! This pregnancy is flying by. I can’t believe that in 8 weeks, our new, sweet little girl will be here. As I am prepping for her arrival, I have been going through baby things that I had with the twins and taking inventory of what I need and what I don’t need. 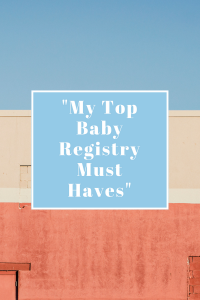 I thought I would take this opportunity to make a list of all the “must have baby items” because I know so many expecting Moms that are rattling their brains trying to decided what to register for. Below is my list of must haves. Some of these do contain affiliate links so I may get a little tip if you decide to purchase any of them. Hot/cold breast pads. Lansinoh TheraPearl 3-in-1 Hot or Cold Breast Therapy, 2 Count for breastfeeding moms. These were a lifesaver in those first days and weeks of breastfeeding. I would put them in the freezer and they helped relieve that discomfort from engorgement and from the littles learning to latch correctly. These are also great for hot therapy to relieve the pain of clogged ducts or mastitis. Breastfeeding salve. This Lansinoh Breastfeeding Salve is another breastfeeding must have. This helped so much with soreness in the early days. Diaper rash ointment. We were very lucky with the girls, and they didn’t get too many diaper rashes, but the ones that they did get were pretty bad. Aquaphor Baby Healing Ointment Advanced Therapy Skin Protectant, 14 Ounce was the only thing that saved their little bottoms and healed them quickly. This ointment isn’t just good for diaper rashes for so many different skin irritations. Multi-purpose is always a win! I love multi purpose pads so much! I can’t remember what fabulous mom told me about these but she deserves a huge THANK YOU! I would lay these under the girls when they were in their beds or pack and plays. All of the spit up would land on the pad, so I didn’t have to change sheets all the time. I had more of these pads than I had sheets. I even used them a few months ago under the sheets of their big girl bed while we were nighttime potty training. These are very similar to the ones I’ve used in the past. Crib. Pretty obvious, I know. I love the idea of a convertible crib, so you get more bang for your buck. Also extra crib sheets. I think 3 is a great number to have on hand. Pack and play. My twins slept in these for the first 4 months or so. They were so small that they didn’t exceed the weight limit for the top until then. After, they were great for play time and wrangling those littles so I could get a shower. Swaddles. These aden and anais Swaddle Blankets are THE BEST! So soft. So breathable. My favorite blankets by far. They are great for swaddling, nursing (when I cared to cover), and anything in between. I can’t say enough good things about these. You will not be disappointed. Nursing Pillow. I loved the Boppy. Definitely helpful, especially in the beginning when the girls were so small and needed lots of propping up to nurse. Nasal Aspirator. I was so skeptical of the NoseFrida FridaBaby Nasal Aspirator , but it is the real deal. Sounds gross, but works like a charm! Trust me. Breast Pump. Obviously, if you are not planning to breastfeed, this is a necessity, but if you are, then get one. You can purchase, but I would recommend going through your insurance company first. Many companies will cover the pump 100%. It’s totally worth checking into. Diapers. Duh, right? Something that I learned along the way is that not all diapers fit all babies equally. Try out some different brands to find the best fit for your little one. Diaper wipes. Another no brainer. You will use these for literally everything. Sound Machine. I did not have one of these with the twins, but I babysat a sweet little boy during the winter and his mom brought one over. Her little man slept so well once we started using the sound machine at our house. I will definitely be getting one for the new baby! Diaper Bag. With the girls, I had a traditional diaper bag. With the new baby, I plan on purchasing a back pack style diaper bag. The other bag was too bulky and I constantly felt like I was bumping into everything when I was out and about. How stinkin’ cute is this one? My favorite nursing tank ever! All the others I tried didn’t fit well with my rather large chest. This one gives great support and after wearing it 1 plus years, it’s still in great shape! I love The Honest Company products. With all the baby products on the market, it’s difficult to find products that you feel safe using on your baby! Just making this list has me so EXCITED about our little lady joining our family soon! I hope you find these suggestions helpful. I would love to hear what is your “must have” baby item! Share with me and feel free to share this post for all your new momma friends!